וּמְסַדֵּר אֶת הַכּוֹכָבִים בְּמִשְׁמְרוֹתֵיהֶם בָּרָקִֽיעַ כִּרְצוֹנוֹ. [G!d] arranges the stars in their heavenly courses according to Divine will. if you can count them." flecks of light against the dark night. on a single point of sky. Rabbi Katy Allen is a board certified chaplain and serves as a Nature Chaplain and the Facilitator of One Earth Collaborative, a program of Open Spirit. She is the founder and rabbi of Ma'yan Tikvah - A Wellspring of Hope, which holds services outdoors all year long. She is the co-founder and President pro-tem of the Boston-based Jewish Climate Action Network. She received her ordination from the Academy for Jewish Religion in 2005.
who have wandered lost and aimlessly through years that might otherwise have been abundant. that the hills support you, the trails guide you and the moon, sun and stars light your path. May you be blessed in the presence of wildness, free, and released in the spirit of the natural world. May you find your wise woman in the call of the world around you. May you bring her home and keep her with you forever, always to journey in joy, light and peace. May the forest enter your heart and never leave. Copyright 2015 Judith Felsen, Ph.D.
Judith Felsen holds a Ph.D. in Clinical Psychology, certificates in hypnotherapy, NLP, Eriksonian Hypnosis, and Sacred Plant Medicine. She is a dancer of sacred circle dance, an AMC kitchen crew, trail information volunteer, trail adopter, and daily student of Torah and Judaism. She is enrolled in Rabbinical Seminary International. She has studied Buddhism, A Course in Miracles, and other mystical traditions. She is a hiker, walker, runner, and lives in the White Mountains with her husband and two large dogs. Her life centers around her Jewish studies and daily application. Often we want to focus on how we are connected to everything else in the Universe, and I write about that frequently, for we are just one tiny part of G!d’s infinite Creation. The Asher Yatzar blessing, however, with its focus on our physical being, offers the opportunity to explore the boundaries and the differences between us and all that is beyond our skin, which can, paradoxically, bring us to greater understanding of our connections. בָּרוּךְ אַתָּה יְיָ אֱלֹהֵֽינוּ מֶֽלֶךְ הָעוֹלָם, אֲשֶׁר יָצַר אֶת הָאָדָם בְּחָכְמָה, וּבָרָא בוֹ נְקָבִים נְקָבִים, חֲלוּלִים חֲלוּלִים. Baruch ata Adonai, Eloheinu Melech ha'olam, asher yatzar et ha'adam be'chochma, u'vara vo ne'kavim ve'kavim, chalulim chalulim. Blessed are You, Hashem/Adonai/Holy One/Mysterious One, our G!d, King/Ruler/Sovereign/Amazing One/Source of All of the universe, Who fashioned humans with wisdom and created within humans many openings - for each physical opening a spiritual opening - and many hollows - for each physical hollow a spiritual hollow. It is traditional to recite these words and the remainder of this blessing after washing our hands after using the bathroom. The idea is to stop. To take a moment to acknowledge our physicality. To take a moment to let G!d into our lives, into our very physical beings. To acknowledge the wonder and blessing of our functioning bodies. I offer this meditation to be used together with these words; sometimes there is more than one option of how to translate a word - I invite you to take your pick. As you recite these words, envision the entire Earth, the entire Cosmos, and feel the energy that surrounds it and flows through it. With your eyes open, focus on what is before you. You may gaze out the window at the more-than-human world or to focus on some item, any thing, that appears in front of you. As you fix your eyes upon the view before you, feel in your heart how you are different from this object or group of items. ...וּבָרָא בוֹ נְקָבִים נְקָבִים, חֲלוּלִים חֲלוּלִים. ...u'vara vo ne'kavim ve'kavim, chalulim chalulim. for each physical hollow a spiritual hollow. As you recite these words, focus first on your lower body and legs and feel the flow - of blood, of energy, of life - that flows thorough the openings and hollows of your body; then focus on your upper body and arms and again notice and feel and be aware of all that flows in rhythm and well-being through your body. When you are ready, continue on with your day. May we grow healthier in body and spirit with each blessing; may we grow in understanding of the special gifts we each hold within us; may we recognize our connections to all the Universe, may we understand our responsibilities to ourselves and to all that surrounds us. My mother's last cat - of many, many cats throughout her life - was named Octavio Paws. Yes, you read correctly. 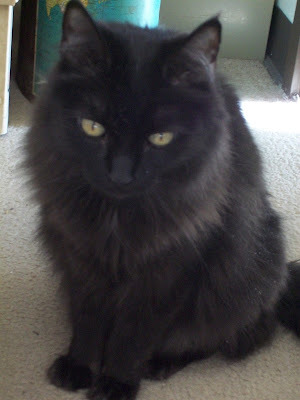 This black cat was named after Octavio Paz, the Nobel-prize-winning Mexican poet. Octavio Paws entered our mother's life while she was still living in her own home and while she also still had a dog. The dog and cat became good friends, and Paws and Ginger and Mary would settle in together on the couch in the evenings and on cold winter nights, keeping each other company. Paws enjoyed wandering in the garden and beyond, through the small town in Southwestern Wisconsin where they all lived together. Paws and Ginger were very solicitous of Mary, and gave her extra attention and love and comfort when she was ill and when she was laid up with a bad leg. They were mainstays in her life, providing emotional and spiritual support to her as she aged. And then one day, Mary had to leave her home and move into an apartment in elderly housing in Madison. A new home was found for Ginger, but Paws was able to come along to the new home. Paws spent the first 24 hours or more in his new, and much smaller, abode yowling. He was not happy. But with time, Paws adjusted to being an indoor cat. He settled in. And over the years, as our mother's health and mental status declined, the importance of Paws in her life grew. The two had very real conversations together. Paws was our mother's confidante, her go-to "person" for questions both large and small - especially in the middle of the night, and he was her constant companion. They discussed what to have for breakfast, lunch, and dinner, and all the other details of daily living, as well as the more profound philosophical questions of life and death and aging and everything else. This was not, I assure you, an abrupt change for our mother - and no one in the family batted an eyelash. Every cat and dog that lived with my mother held an important place in her heart and in her life. She talked to all of them as equals. They were part of her life and her family. As our mother aged, I worried. What would happen if Paws died before she did? I couldn't bear the thought. But it didn't happen that way. Our mother died in her bed at night, and Paws was found curled up beside her in the morning. At first, my brothers and I didn't know what to do with Paws. A friend, who had cared for Paws when Mary had been in the hospital,was a likely person. But then my teenage nephew arrived for the memorial service, and in no uncertain terms he told his parents that they were taking Paws back to New Hampshire to live with them. And bless them, they did. Paws lived out his years in the country, learning again to be an outdoor cat but to come in at night when the coyotes might be out. He stayed close to home, but loved to wander near by, and he came in when called. More than once reports from my brother sounded as though Paws' life was coming to a close. But this little black cat kept on going and going. He kept going until two nights ago when that familiar yowl was unexpectedly heard, the yowl that also meant, "I've brought you something to see," after catching a mouse or other small animal. But this was Paws' last time to yowl. Soon after, held by my brother and sister-in-law and nephew, Octavio Paws breathed his last breathe and went to join his mother in the place where cats and their owners meet again. Paws will never be forgotten. He will be remembered for his yowl, and he will be remembered for being a people-loving cat. He will be remembered for his gentle spirit. He will be remembered for accompanying our mother through her declining years. And he will be remembered for modeling resiliency, for adapting - after a few yowls - to all that life dealt him. He will be remembered because he was loved, so deeply and so unconditionally, by so many people, most of all, by our mother. Thank you Paws, for being part of her life, and part of ours. V’ahavta et Adonai elohecha b’chol l’vav’cha uv’chol naf’sh’cha uv’chol m’odecha. This verse (Deut. 6:5) is commonly translated as: And you shall love the Lord your G!d with all your heart, with all your soul, and with all your might. What does this really mean? I invite you to journey with me, as we look a little more closely at some potential meanings of the key words here. L'vav'cha – This is the word layvav with the suffix meaning “your” (which each of the three key words here have). In the Biblical dictionary (Brown, Driver, and Briggs, A Hebrew and English Lexicon of the Old Testament), layvav can mean: inner person, mind, will, heart, soul, memory, determination of the will, conscience, and seat of emotions and passions, as well as seat of courage. Nefesh – This word also has numerous meanings, including: that which breathes (due to G!d breathing into the nostrils), breathing being, soul, inner being of human, a living being whose life resides in the blood, human self, self, seat of the appetites, seat of emotions and passions, and breath. Me'od – This word connotes muchness or abundance, and can mean force, might, exceedingly, greatly, or very. Clearly, many possible options exist as to how to translate this verse, and scholars attribute certain meanings to the context here. And you shall love YHVH your G!d with all your heart and with all your soul and with all your wealth. Rabbi Eliezer says: "Since it is said (Deuteronomy 6:5) [You shall love your G!d] with all your soul, why is added, With all thy wealth? And since it is said, With all your wealth, why is also added, With all your soul? This is to teach us that in case there is a person who loves himself more than his wealth, for him it is said, With all your soul. And if there is a person who loves his wealth more than himself, for him it is said, With all your wealth. ..."with all your might [meodeka]" — with whatever measure [middah] He metes out to you, you return to Him thanks [modeh]. And from the Medieval period, we learn more, the first two from commentaries on the Torah, and the third from a code of law. While alive you are to love G!d with all your heart, if your faith and love for G!d is put to the test of your having to choose it over your very survival, you must choose the former. B'chol l'vav'cha - with all your heart; with all your love, your desire, your compassion, cleave to G!d. Close your eyes and focus your attention on your heart. Bring all of your senses, bring all of your body and your mind into focusing on your heart. Feel your heart growing and filling a larger space. Maintain your focus on your heart and a sense of G!d's presence in your heart. U'v'chol nafshecha – with all your soul, your breath, your physicality. Maintain your focus on your heart, but now, feel your heart breathing. Keep your breaths even and regular, but feel how they begin and end in your heart. Keep breathing gently, in and out, to and from your heart. Be aware of the significance of your breaths. U'v'chol me'odecha – with your full being, with all that you are and all that you can be. Continuing to breath regularly, now consider something or someone or some activity you love very much, an image that fills you with a sense of well-being; allow this feeling to fill and overflow your heart. Feel the sense of abundance expanding outward from your heart. May it be that all that you have experienced here shall remain in your heart, and that you will spread these good and powerful feelings with diligence to your children and to all those around you, at all times, whether you are at home or at work or with friends, when you retire for the night, and when you arise again the next day, may your heart focus, your heart breathing, and our heart feeling never depart from your heart. *This meditation is adapted from the Quick Coherence® Technique for Adults developed by the HeartMath Institute, which I first read about in Teaching as if Life Matters, by Christopher Uhl.